Ibrox Noise: Have Rangers' board finally got it right? Have Rangers' board finally got it right? This is going to be the last time we are going to discuss Graeme Murty on here. You can all breathe a sigh of relief already. The bottom line we wish to address is the absolute categorical systemic failure at both board and football level which has blighted the club recently and frankly embarrassed us. A few supporters did want Murty to get the job permanently. We were not one of them. We knew it was absolutely the wrong appointment, just like Pedro had been, but the ‘staunch loyal’ knew better and the day it was announced was a painful day for many of us. That press release on the official site where Murty’s frozen grin and forced soundbite about how he had always wanted this job was excruciating given only a few weeks earlier he’d admitted he hadn’t come north to become Rangers manager, only to develop his coaching skills at Rangers’ Academy. But here he was, paraded as boss, in a move which was absolute desperation from the board after McInnes’ knock back. Many ‘thank’ Murty for saving us, for taking the job and getting us out of a pickle. No mention about the massive wage rise a youth coach was getting, nor his complete unsuitability for the role. Just a thank you for taking a job. But it’s not all his fault. The board, scraping the barrel, having made two calamitous appointments in a row, decided to go the whole hog and make a third. 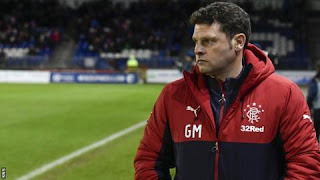 There was nothing about Murty which pointed to his ability to handle this job – and yet Rangers suits, half of whom have now gone in all fairness, decided he was the right man to get us to the end of the season. Well he wasn’t. His either resignation or sacking proves that one. We are appalled at the football mismanagement of our club in recent years. We haven’t had a real manager since Walter Smith, and if we play devil’s advocate, we absolutely know Steven Gerrard is a risk. A worthwhile one, but still a risk. But the board had to do something. They had to get someone with real clout – a true Hollywood star of the game. Someone who understood real pressure at the top of the sport and had been a marquee name in his playing days. We couldn’t seem to find the right established manager, so we’ve gone for a megastar player turned coach who could be the right manager. It’s a bold risk, and for all their calamities recently, Rangers’ board are ballsy in going for this route – it’s one we just can’t condemn, for inasmuch as it could be John Barnes, it could be Graeme Souness. That said though, their heads are once again on the chopping block. Arguably two of the three from 2015 paid for bad decisions with their roles – that is right and proper. If Gerrard turns out a flop, King simply has to go. But if his and the board’s risk pays off, and my God, we hope it does, we will be the first to say well done and congratulations gentlemen. But wow, they really have screwed up so many times in the past few years – surely they have to get this one right?! Said all along that when players know a manager's contract is up in the summer it allows potential for people to down tools, mutiny even. It happened to Smith when going for 10 in a row to a smaller extent. It happened to Wenger most recent seasons. And it clearly undermined Murty. Only time will tell if they got it right we been here more than most in a short time scale but what ever it is good or bad we must let the next manager run his full term it takes time to get things right and longer when we are in such mess like we are in. The board make decisions in the best interests of the club. 3 games to go, need to qualify for Europe and pick up spfl prize money. The facts of Murtys reign are there for all to see. Relieved of duties. Right call, regardless of all else. Move onwards and upwards. If they get it wrong will we see a future takever attempt by murray, gilligan and co? Send Mr King off with the other two and get some decent leaders in the club. The recent managers choices have been disgraceful ! It would be some coup in the same way as souness, gascoigne ect.footbal legends who have graced our club, ignore the bitter!they could only dream of having had all 3 at tintoon if it happens. If Gerrard is announced we’ll likely finish second just from the boost the players will get trying to prove themselves. I fancy Jimmy Nichol to get us playing anyway. He’s an experienced head. This is an unpopular opinion, but I believe this is another disaster in the making. We’re replacing an unqualified U-20 coach with an unqualified U-18 coach. He may be Stevie G, but he’s not a miracle worker. The bigger problem is that the entire squad is rubbish and needs to be replaced and/or upgraded. That takes a lot of money which may or may not be coming. But even if new investment is brought in, it will also take a lot of time to turn over that many players. Several have longer term deals in place and cannot be easily moved (*cough* Pena *cough*). There is also the issue of time - we have about 9 weeks until the European qualifiers, and the players are going to need a bit of time away from Ibrox. Gerrard isn’t going to have a lot of time to turn things around before the games start counting. On the bright side, we can all be sure he won’t be standing in a bush while berating supporters if we lose in Luxembourg again. At least there’s that. You're right Johnny. It's a disaster in the making. Let's push the boat out and get Tommy Wright from St Johnstone. After all he did keep them several points above the relegation zone. Then we can tell football legend Steven Gerard that his services are not really required. When Pedro didn’t work out Board were in difficult position. McInnes was only immediate choice. When he turned us down it would have been impossible to get a long term guy quickly. Murty would have been given chance till summer whist board looked around. If we had already clinched 2nd spot and beaten Celtic twice he would have been favourite. Feelers will have been going out since Xmas. January deals were only loans but approved by Murty. He was given a fair chance. We don’t know who else Rangers approached. If gerrard is guy. King is a bit of a distraction. He got rid of crooks in charge. He didn’t appoint the breadman but got screwed by him and Pedro was Paul Murray’s choice. I think King is involved now. All this talk about him having to offer shares is the SCOTTISH legal and banking establishment playing games at Rangers expense to make money for themselves. Yes we will be. But that applies to everyone not just Steven Gerrard. Do you think any of the names banded about would guarantee the rise back to the top? I don't think so! This is a thoroughly decent guy atrociously treated by our club and was a victim of circumstances. If people cast their minds back to when he took over, at the beginning there were a few shaky games, then Florida came around and we started to play some good football and get results. So much so by the OF game at Ibrox a sizeable number of the support genuinely thought we could win that game. For the first time in a very, very long time the fans were actually not dreading going into an OF game. Murty was the guy who had got us to that point. Yes he did make a tactical error in that game and we lost a game that we should have won and he was destroyed for it. All of the fans that had built up their hopes on the back of a really good run had them dashed and the frustration felt was way higher than it would have been otherwise. Hardly surprising that the fans vented their anger. At a time when those in charge of our club should have had cool heads and NOT responded to the anger of the fans our so called chairman picked up on the venting and sent that ridiculous letter for ST renewals. In it he basically threw Murty under the bus and the very next game the players didn't turn up. What a surprise? They knew the writing was on the wall for Murty and just decided not to play for him any more and haven't bothered since! I really think we are where we are because of our dickhead chairman and board who were toothless about doing anything about it. I'm embarrassed to be a Rangers supporter, to be honest I'm absolutely disgusted at what our great club. If treating Murty atrociously was giving him the job of a lifetime and seemingly backing him in the January transfer window then we are guilty as charged. Murty was given a window to show what he could do and may pick up other work on the back of it. Something that almost certainly would not have happened if he had stayed buried with our Under 20s. He made many mistakes, some of them pretty big, and he had to go. But he showed potential at times and he'll be a lot better for the experience. I think someone will take a chance on him. Let's say he picked up a job at somewhere like Clyde or Dunfermline or maybe even one of his old clubs down south which has been suggested. Do you think those opportunities would have arisen if he hadn't been handed the Rangers job? So let's not feel too sorry for Murty!